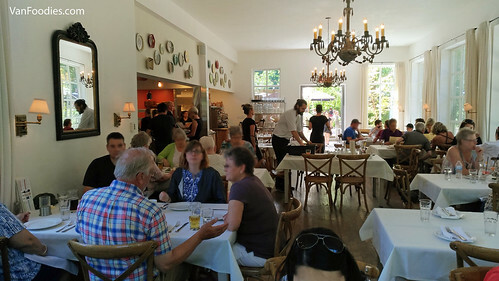 While we were there, we had lunch at the Cuckoo Trattoria Italian Restaurant next door. It has a good selection of pasta and pizza dishes. With the four of us, we ordered 2 pizzas and 1 pasta to share. It may not sound like a lot of food, but you know why?! 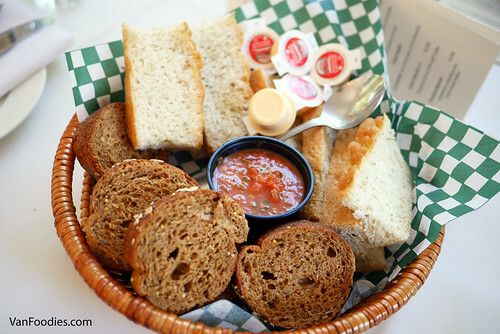 They gave you a giant basket of bread, with butter and marinara sauce, to start! 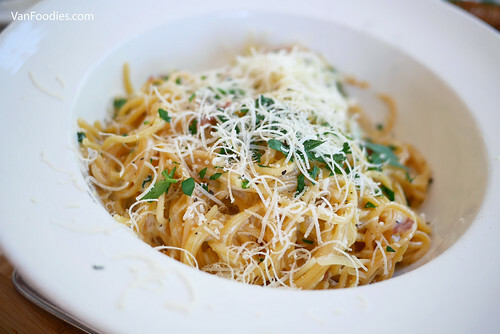 For pasta, we went with a classic Spaghetti Carbonara, made with pancetta, fresh cream, Parmesan and egg yolk. The pasta had a good texture, al dente; the sauce was creamy but perhaps a bit too thick, which made the pasta clump together and rather clunky to scoop. 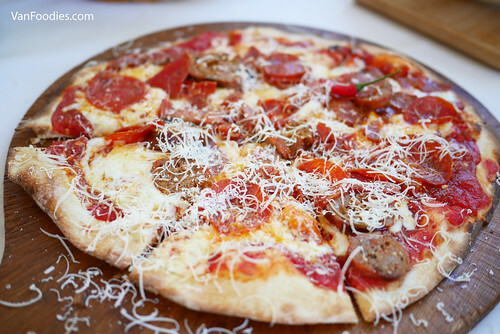 The first pizza was Vesuvio, a spicy, meaty one, with pepperoni, hot Italian sausage, spicy salame, hot capicollo, chili garlic inferno sauce and mozzarella cheese. It had a good amount of heat, but with so many types of deli meat, it was a bit too salty for our liking. It was messy to eat, with hot sauce and meat sauce trickling down our hand, but it was a satisfying pizza for meatatarian. 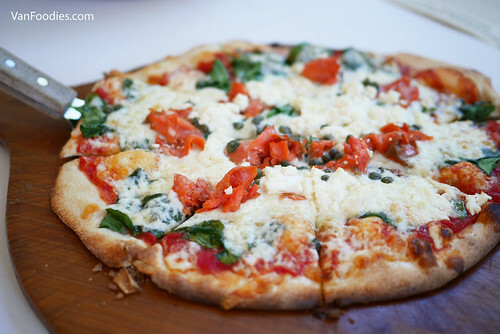 For the other pizza, we opted for something lighter, the Salmone – fresh spinach, wild BC smoked salmon lox, capers, goat cheese, crushed tomatoes and mozzarella. Lox and capers are a classic combo; the goat cheese was definitely a change from the typical cream cheese. 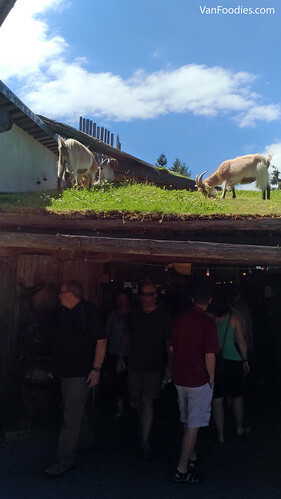 There is a hint of gamey taste in goat milk, and it provided extra richness to the pizza. It does remind me of a lox and bagel. 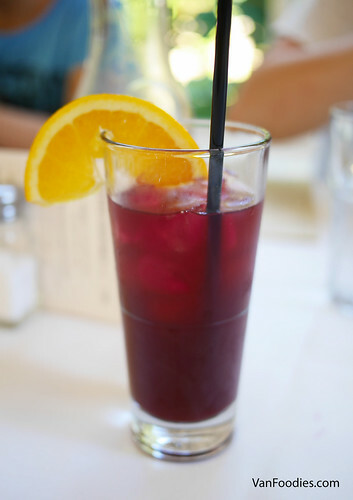 We also shared a 1L carafe Sangria. It was perfectly split into 4 glasses, and it was boozy! There was a generous amount of red wine in the carafe. I thought was pretty good for $20. Overall, the food at Cuckoo was pretty good. There are a couple restaurants in the area and I think Cuckoo was a good choice. We are not big carbs people so 3 plates were enough for us. However if you are a fan of dough, go for the Paesano Deal, available for parties of 4 or more. For $24.99 or $29.99 per person, you will be served a number of platters to share, family style. It’s a good deal if you enjoy a carbs overload meal!